Alasdair Nottingham gave a nice overview of the options we have for installing WAS Liberty. There are a few options, but I think he did a good job of explaining their existence. One thing I wondered about was the broader use of the IBM Java once you got hold of it. For example, how do I know the Java is being used? Can I package it back up with my server? So, I did a bit of experimenting. You can download the WAS Liberty Zip that includes IBM Java from the WebSphere Liberty Repository here. This zip, as the name suggests, includes all the features required to run Java EE 7 Web Profile applications. At the time of writing, the server is licensed for development use, with limited production use (just in case it changes ;) ). To get started with Liberty and IBM Java, you just unzip the package. E.g. If you're familiar with other Liberty packages, the new directory to note is the one called java. That's it, that's the IBM Java. This creates a server called myServer with the default configuration to start the webProfile-7.0 feature (see the featureManager entry in wlp\usr\servers\myServer\server.xml). From here you can install more features using bin\installUtility, develop and deploy applications and so on. You can start the server using the start or run commands. E.g. Check to see which Java is being used (e.g. using Task Manager or ps). I got a bit of a surprise as mine wasn't using the included IBM Java. This was because I already had Java on my system and so it picked that one up based on my JAVA_HOME setting. You need to unset that to get it to pick up the included IBM Java (e.g. set JAVA_HOME= ). Let's say you've finished developing your super awesome application or you've created a custom server install that you want to package up, including the IBM Java. This is useful if for example to create a distribution to put on another system whilst not having to rely on the right level of Java being provided on that system. Before you do this, though, you might want to change the licensing for production use. If you've purchased a WAS Edition, you can apply the license using a license.jar that you download for Passport Advantage. OK, back to packing up the server. This is simple, using the server package command. This creates a wlp.zip file with all the runtime, include IBM Java under the wlp\usr\servers directory. This creates a myServer.zip with all the runtime, IBM Java, server configuration and application(s) under the wlp\usr\servers\myServer directory. That's it! Pretty simple really. The only real gotcha from my perspective was the JAVA_HOME. I hope you find this useful. Please comment if there's something I could explain better or you spot a mistake. Thanks. 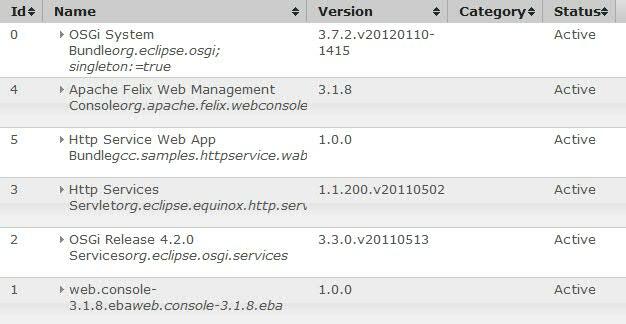 The Felix Web Console provides a nice set of console capabilities for OSGi runtimes and there are also some plugins to augment the out-of-the-fox support. It just so happens that the only mandatory pre-requisite service (other than an OSGi Framework, of course) is the Http Service. So, I wondered if we could combine the approach taken by Ralf to enable the Felix Web Console and thus get useful insights into what's going on inside an OSGi application running on the Liberty Profile. Well, not surprisingly, the answer is "yes". You need to add four bundles to your OSGi application and so it's not the most elegant solution in the world (note, I used Felix Web Console 3.1.8. which has a distribution that includes its pre-req's. If you use the latest Web console (4.0), or the 'bare' distribution you will need to also add its pre-req's to the application). The Felix Web Console is for managing OSGi frameworks and so it lets you modify the life-cycle of individual bundles This is not advisable for OSGi applications, where the OSGi application runtime manages the life-cycles of these bundle for you. org.apache.felix.webconsole The Felix Web Console. This can be downloaded from here. gcc.samples.httpservice.wab The Web Application Bundle that registers the Equinox HttpServiceServlet. It's this servlet that provide the Http Service implementation. The WAB has a default context route of /httpservice. This can be downloaded from here. It contains no code, simply web.xml configuration for the HttpServiceServlet. 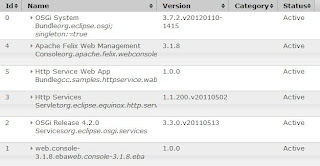 org.eclipse.osgi.services Provides the APIs for the Http Service implementation. This can be downloaded from here. 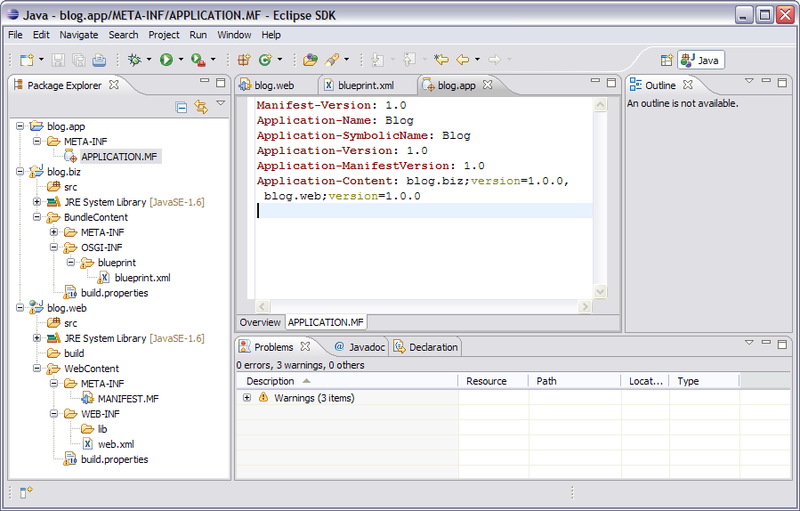 org.eclipse.equinox.http.servlet Provides the HttpServiceServlet implementation. This can be downloaded from here. For some reason this jar is not available in later equinox releases, but I believe that to be a infrastructure mistake, not a sign it was removed, so I'd hope that will be fixed soon. The documentation for the Felix Web Console can be found here. If you use the bundles as-is, without changing the context route, you should be able to point your browser at http://<server>:<port>/httpservice/system/console (as described on the Web Console documentation). Log in with "admin" & "admin" and the console should be displayed. From the bundles view, you can see bundle status, package imports/exports, navigate package dependencies. There's a services view where you can see the registered services, who's providing them, who's using them, and so on - all the sorts of things you need to be able to do to track down problems. The following is an example screenshot of the Web Console for the above application definition. Bundles 2-5 are the bundles we configured in the application definition. Bundle 0 is the system bundle and bundle 1 is the bundle providing imports into the application. If you drill down on this you'll see it provided the servlet packages required by the Web Application Bundle. For the past few years I've been working in the OSGi and SCA standards groups with a view to bringing together the best of both worlds in a complementary way. I gave a presentation at the OSGi Users' Forum UK at the beginning of this year on OSGi and SCA and how the two can be combined to add heterogeneous integration capabilities to OSGi services. This included a demo of Apache Aries and Apache Tuscany, turning an Aries OSGi application service into a Web service. The OSGi Applications and JPA 2.0 Feature Pack enables you to develop and deploy modular enterprise OSGi applications, in production and at no additional expense (sounding like a salesman...must stop). Building applications in this way enables greater flexibility, re-use and sharing of components between applications, which itself reduces disk and memory footprint. The SCA Feature Pack refresh adds a new implementation type (osgiapp) that allows you to take an OSGi application and integrate it with other component types (e.g. 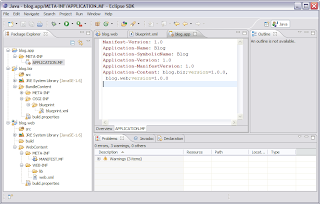 Java EE), and/or add protocol bindings to OSGI application services or references (e.g. Web services, Atom, EJB). One of the problems with developing applications using OSGi is the limited capabilities of the tools. Also, many of the Enterprise OSGi technologies are new, or have recently added OSGi capabilities to existing technologies and hence, require new tools or the existing tools to catch up. IBM has just made available some free OSGi application tools on DeveloperWorks. These enable you to develop OSGi applications following the design used in Apache Aries and also the WebSphere OSGi application feature pack. They also enable you to develop Web Application Bundles (essentially a WAR with Bundle metadata), Persistence Bundles (a JPA persistence archive with bundle metadata), vanilla OSGi bundles, and to edit Blueprint XML files (a standardized form of the Spring Framework component model). The same tools, and more, are also available in the current RAD beta. If you give the tools a try, I'd be interested to know what works for you and what doesn't. If you have any problems or require assistance, there's also a forum for you to ask questions.